Recently I was given some 3CE products to try and review by Luxola.com because they now carry this awesome Korean cult brand! Say goodbye to paying $20 for shipping :') Also, shop with faith on Luxola because you can trust that the products you're getting are authentic. Many blogshops these days carry 3CE too but for sure we can't testify for their authenticity, while some look downright fake. Ok now down to the review! I've never tried their lipsticks, so I didn't know what to expect. Judging from reviews online, its a long-wearing color and is also very pigmented. Edgy, black and so 3CE! The bullet is kinda small as compared to my other lippies... or maybe the packaging was just excessively bigger. This is the truest color swatch I can give. Its a bright, milky coral that leaves a slight stain after wearing off. 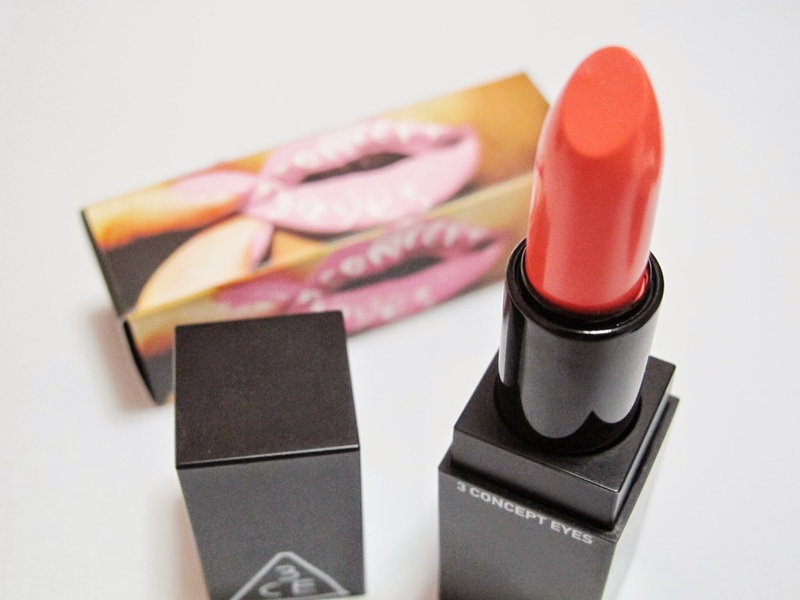 This lipstick is indeed, very pigmented and long-lasting! Its also super glittery, with glitters big enough to be seen. Its a ~my type~ of color but I didn't really like the glitters. I would still wear it because, its creamy and pigmented and really, lasted long. 3 Concept Eyes generally price their products higher than generic Korean cosmetics, but I've tried a lot of them and only the lip laquer really disappoints. Will be reviewing more items soon (loose powder, blusher and gel eyeliner)! Check out Luxola for more 3CE! It's a shame that theres so many glitters though because other than that, it's a really nice colour!